Piotr Wyrd facing off against an enraged super soldier. You have to be a truly special kind of person to live your life fully as a superhero. Not just the whole business of having a secret identity, but to really be a superhero from top to bottom in an existential sense. You have to find deep, meaningful fulfillment in being of service to others, regardless of the task at hand. That kind of selflessness is rare, and something that neither of the heroes of this week’s best new comics have in any great quantity. To them, saving the world isn’t something one does because it’s a “good” thing to do—they do it because they must, and, ideally, are going to be paid in the process. Supreme Justice and Tabu discussing Peter Cannon. 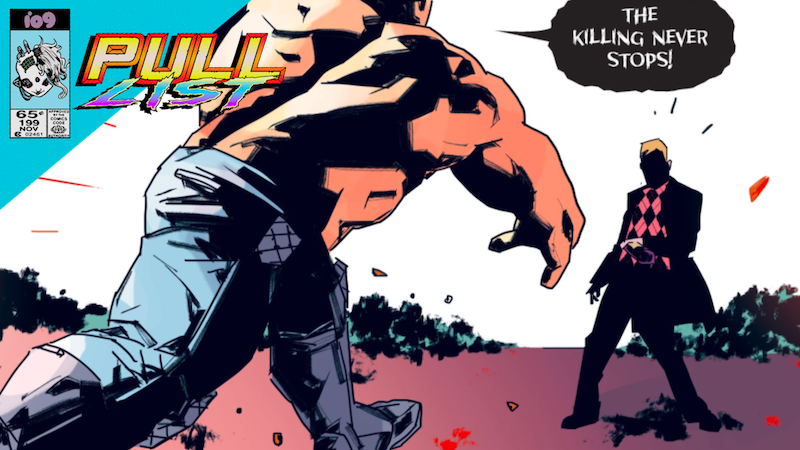 The way Peter Cannon steps onto the scene in Dynamite’s new Peter Cannon: Thunderbolt, from writer Kieron Gillen and artists Caspar Wijngaard and Mary Safro, you’re immediately meant to stop and try to remember just what you know about the character and his comics history. Cannon isn’t a new character, but he’s one whose origins and subsequent adventures (including a brief bid for a spot on the Justice League in the ’90s) often go forgotten because of how he became the inspiration for another peak human wunderkind hero. Pitor Wyrd enjoying a cigarette. Compared to the rest of Wyrd’s large cast of characters, who are all in constant contact with the world around them, the book’s titular hero comes across as being largely disconnected from everything. Unlike most other special operatives, Piotr Wyrd cannot die, and like most nigh-immortal beings, Wyrd has a difficult time really caring for the world anymore.